Two members of former EU Commissioner John Dalli's cabinet told Olaf, the EU's anti-fraud agency, that on two occasions the former Commission had tried to push for the ban on snus to be lifted, Giovanni Kessler said in court this morning. Mr Dalli immediately issued a statement accusing Mr Kessler of perjury and saying he expected the police to take action. The head of the EU’s anti-fraud agency is in court this morning in the case brought against Sliema restaurateur Silvio Zammit. During the sitting, Mr Zammit pulled the middle finger at Mr Kessler as the latter identified him. Throughout the sitting Mr Zammit is constantly passing comments, implying Kessler's testimony put "Pinocchio to shame". In a statement, just after noon, Mr Dalli issued a statement saying he is following Mr Kessler's testimony with disgust. "I will comment later on his testimony." "I will comment now hon his new fabrication purported to be testimony from Joanna Darmnanin and Paula Duarte. "The dates stated by Kessler are invented to coincide with his theory of meetings. But he did not realise that on one of the dates mentioned – the 28th February 2012 -, not only did I not propose a lifting of the Snus ban but I signed off with my Cabinet and Sanco staff, the parameters on which Sanco based its impact assessment which is the first step for the directive. "These parameters included a ban on Snus and all smokeless nicotine products. "This is documented and can be verified. "This is perjury and I expect the police to take action," Mr Dalli said. This evening, Mr Kessler will be testifying in the Privileges Committee hearing the breach of privilege complaint filed by Prime Minister Joseph Muscat against Opposition leader Simon Busuttil. Dr Muscat is claiming that Dr Busuttil committed a breach of privilege when he accused him of political interference in the police investigation into bribery allegations that had forced John Dalli’s resignation as European Commissioner in 2012. 10.13: Soon after taking the witness stand Mr Kessler was shown a copy of the report he had forwarded to the Attorney General and confirmed it was his. He is explaining regulations that govern how Olaf carries out investigations. It is the Olaf director general who is entrusted with investigative functions. 10.15: Kessler says he participated personally in some of the investigative acts - interviews with John Dalli, Silvio Zammit and Gail Kimberly. 10.18: Asked what triggered investigation, Kessler said on May 24, 2012, he received from the European Commission's secretary general Catherine Day a transmission letter - i actually remember this quite clearly, he remarked. 10.19: Day said she received on May 21, a report from Swedish Match with some facts on Silvio Zammit and then Commissioner John Dalli. The facts were brought to attention of Commission President Barroso and he asked Day to forward the allegations to Olaf. 10.20: Olaf had to investigate any misconduct or possible misconduct by any member of the Commission. 10.21: Investigation was concluded on October 15. 10.22: Kessler is asked to explain how the investigation took place. 10.24: Kessler says on August 20, 2010, Silvio Zammit accompanied Estoc (Association of Snus producers) chairman Hammerby to Kempinski Hotel in Gozo where John Dalli was on holiday. The main discussion was the issue of legalisation of snus tobacco. 10.28: Kessler says that according to WHO regulations on tobacco regulation any dealings between public officials and tobacco industry must be public and transparent. These regulations to which the EU is a signatory prohibit private meetings. 10.29: Kessler says Zammit was the man who organised the meeting and asked Dalli twice for a meeting with the Snus producers. Zammit also accompanied the Swedish tobacco officials to Gozo. Kessler says Dalli, at one point, had a tete-a-tete with Hammagren on his own. 10.30: Kessler says this was not a casual or surprise meeting for Dalli because it had been organised by Zammit and accepted by Dalli. 10.31: Kessler says that for the Swedish tobacco guys this was 'bingo' because they knew they could not have private meetings with the Commissioner without going through the whole bureaucracy. Kessler is asked to identify Zammit in court and points him out. Zammit pulls out the middle finger. 10.38: Kessler says after the meeting Hammagren wrote a report in which he disclosed that Dalli wanted to get information on snus even though he was aware that he could not meet tobacco producers. Kessler says Zammit was the man with the golden key that gave them access to the man responsible in the Commission for tobacco regulation. 10.41: Zammit is heard saying Kessler is lying. 10.42: Kessler says that Zammit proposed himself as having strong ties to Dalli. 10.43: Delfosse informs Gabrielson from producer Swedish Match of the link and they opt for this channel which bypasses the official Commission channels. 10.44: Swedish Match hire Gail Kimberly as their lawyer to speak to Dalli. Kimberly meets Swedish Match officials in Malta in December 2011. 10.46: She says that she will liaise with Zammit. Kimberly informs Swedish Match she will meet with Dalli on January 6, 2012. The meeting is organised by Zammit who also accompanies her. 10.50: Kessler says Kimberly confirmed the email when spoken to. Even Dalli confirmed the meeting and it is also documented by the emails Kimberly exchanged with Gabrielson of Swedish Match. Kimberly also says she has an email for February 4, which was then rescheduled to February 10. Kessler says Gabrielson prepared Kimberly for this second meeting. Kessler says this had to be a more concrete meeting seeking the allies and enemies of snus liberalisation in the Commission. Kessler says on February 7, Zammit calls Kimberly telling her the Commissioner does not want to meet with her but will only meet him (Zammit). 10.55: Kimberly does not inform Swedish Match of this but puts down in writing the instructions she gave Zammit to carry out the meeting himself. Kessler reads out Kimberly's points: give Dalli these documents and then a series of questions, including who are the enemies and allies. 10.57: Kessler says Kimberly confirmed during her interrogation the instructions she gave Zammit. Olaf found the report on Kimberly's laptop, which she was carrying with her during the interrogation, and the file properties showed it was created on February 7. 11: Kessler says Olaf has no power to summon witnesses. Olaf has a duty to inform the person of concern to the agency in its investigation, that she was being interviewed as a witness. Zammit is constantly passing comments, implying Kessler's testimony put "Pinocchio to shame". 11.04: Kessler says Olaf acted with the greatest care to avoid any leaks of the investigation given the sensitivity of the case. 11.05: This, Kessler says was the reason why Kimberly was not informed beforehand that Olaf investigators would speak to her for that first meeting in Portugal. Kessler says the element of surprise meant that Kimberly could not have changed the properties of the computer file. 11.07: Kessler says Kimberly admitted she did not tell Swedish Match that she was not present for the February 10 meeting with Dalli because she used Zammit. 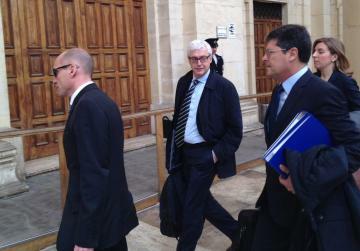 11.13: Kessler says Dalli had denied meeting Zammit on February 10 in his first interrogation. But the meeting did happen because Olaf was subsequently informed by Dalli himself that he had met Zammit in the morning. Dalli told Olaf they did not talk about snus. Kessler says Olaf had a confirmation that the meeting took place but not what was discussed in it. Kessler says that further confirmation of the meeting was obtained through mobile phone call logs that showed calls between Zammit and Dalli and Zammit and Kimberly, an hour later. Kimberly had confirmed to Olaf she met Zammit at Peppi's Kiosk on February 10. 11.17: Zammit hands Kimberly paper and tells her Commissioner can suggest no ban but it will have a cost with six zeros. 11.18: Kimberly reports immediately to Swedish Match Commissioner could suggest lifting the ban but it will come at a cost. Kessler says Gabrielson from Swedish Match was shocked by the news. She invites Gabrielson to meet Zammit. Gabrielson comes on February 12 and meets Zammit on February 13. 11.21: Kessler says Zammit told Gabrielson the cost would be €60 million because the Commissioner would be putting his political career on the line. Zammit is heard saying Kessler is lying. Kessler says Zammit told Gabrielson Dalli would be ready to meet him and an initial sum of €10 million had to be brought over. Kessler says Zammit was using the Commissioner's name and adds this is something Dalli could have been aware of. 11.28: Kessler says that two members of Dalli's cabinet told Olaf in a separate investigation that on two occasions he had tried to push for the ban to be lifted. The meetings were formal cabinet meetings and the officials were Joanna Darmanin and Paula Duarte. 11.33: The court is suspended for five minutes. 11.42: Kessler says Darmanin was head of Dalli's cabinet and Ms Duarte was head of the tobacco issue. According to them on January 24 and February 28, 2012, Dalli had raised the lifting of the snus ban in cabinet meetings. He asked what could be done. Kessler says the timing of the cabinet meetings was crucial. Kessler says several sources confirmed the February 10 meeting took place and it was about snus. On February 20 Kimberly is informed by Swedish Match they were not interested in continuing down this route. Kessler says Zammit tries to re-open the way with Estoc and writes to Inge Delfosse on February 18 telling her he had something interesting for her. 11.46: In the same days, Zammit was proposing something interesting to Estoc against payment. He exchanged telephone calls with Dalli. Zammit's defence team objects to what they say is Kessler's interpretation of facts. 11.47: Magistrate disagrees, insists he has not seen extra colour being added to facts. Magistrate says he has no reason to stop witness himself. 11.49: He says there were not many phone calls between Dalli and Zammit except those related to these events. 11.50: Kessler refers to a March 16 email by Delfosse to Zammit in which she refers to a public meeting with Dalli on March 7. 11.51: Delfosse asks Zammit whether he could arrange an informal meeting with Dalli since the tobacco directive was nearing crucial stage. Call logs show Zammit called Dalli on March 16. 11.52: Delfosse calls Zammit and he tells her a change of the proposal will cost you. Zammit hangs up and calls her 30 minutes later. Delfosse records this second conversation. Kessler says the recording was a turning point for the investigation. 11.55: Zammit tells Delfosse Commissioner will propose to lift the ban. He tells her he can arrange high level meeting. The meeting can be anywhere in the world and it will come at a cost of €10 million as a first installment. 11.57: Zammit tells Delfosse the meeting can be anywhere, on a mountain, in the sea. He tells her to inform "us" not "me" where the meeting will be held. The €10 million will have to be paid after the meeting. This is the gist of the audio recording, which Kessler says represented a turning point. Kessler says that at no point is the name of John Dalli mentioned in the conversation, but it slips from Delfosse's mouth. Kessler says Delfosse was constantly referring to their respective "bosses". Noon: Kessler says Zammit told them during the interrogation his "only boss was God". 12.01: Kessler says the request for a bribe made by Zammit to Swedish Match and Estoc were the same. 12.04: Kessler points out Zammit made bribe requests immediately after meeting or talking to Dalli. Kessler says Zammit called Kimberly and Dalli in the 10 minute break during his March phone call with Inge Delfosse. "I am following Kessler testimony with disgust at the manipulation of facts. "I will comment later on his testimony. "I will comment now on his NEW fabrication purported to be testimony from Joanna Darmanin and Paula Duarte. "This is perjury and I expect the police to take action." 12.11: Kessler says interview with Zammit took place on July 4, 2012. Kessler says interview was surreal. After a few hours of interview, Zammit said he had to go for health reasons. Kessler says he asked him to stay another hour or meet again the morning after. A second interview took place following morning. Kessler's testimony is over. He will be cross-examined by the defence in 30 minutes time. 12.15: The sitting is suspended for 30 minutes. 12.57: Cross examination of Kessler to start now. It is being led by defence lawyer Edward Gatt. 1: Gatt asks Kessler whether the letter from the Commission's secretary general that triggered the Olaf investigation made reference only to Swedish Match and not Estoc. 1.03: Kessler confirms it was Swedish Match that wrote to Commission with allegations. Gatt asks about an allegation that Zammit had tried to obtain EU funds for illicit use, which Olaf found no proof of. Kessler says Olaf never made verifications with other EU bodies to determine whether Zammit had ever applied for EU funds. 1.04: Kessler says Zammit had told them he never applied for funds and Olaf took his word. 1.07: Gatt asks why Olaf never took a clear position on whether the accusation against Zammit was trading in influence or bribery and whether Olaf were consulting Maltese authorities on the legal system. Kessler says nobody from Malta told them what conclusions to reach. Olaf had expertise to study national legislation. 1.08: Kessler says the transmission letter to Attorney General mentioned facts of possible criminal relevance related to Zammit, Kimberly and Dalli. 1.10: Kessler says during the investigation Olaf never had any contact with any Maltese authorities. 1.11: The only contact came after the Olaf report was published and investigation was over when Police Commissioner John Rizzo travelled to Brussels to speak to Olaf. 1.14: Kessler says in December 2012 he queried with Rizzo about the possible arraignment of Dalli. Kessler says Rizzo informed him that a decision was taken to also charge Dalli but this couldn't be executed because Dalli was abroad. 1.15: Kessler says the phone call was a courtesy call to wish Rizzo a happy Christmas and Rizzo told him to keep the Dalli arraignment information confidential. 1.18: Gatt asks whether Maltese authorities ever informed him that they found something different. 1.19: Kessler says when Rizzo visited Olaf in Brussels, told him that Dalli admitted lying to Olaf that he did not know about snus investigation. 1.20: Kessler says Olaf had reason to believe Dalli knew about the investigation because Kimberly called Zammit after being interrogated and Zammit called Dalli. 1.21: Gatt asks about the two people who allegedly asked for money. 1.23: Kessler confirms Gabrielson and Delfosse had asked for money. 1.24: Gatt queries Kessler's testimony that Zammit was not boasting when he told Gabrielson and Delfosse he could arrange a meeting with Dalli and guarantee a proposal for the snus ban being lifted. 1.25: The Olaf report concluded that Gabrielson and Delfosse understood the requests for money came from Dalli. 1.27: Kessler says in the recording Zammit speaks of "he" when talking about the request for money. Kessler says Zammit was not an ordinary individual but the "golden key" to the Commissioner. 1.28: Gatt queries the new revelation on the evidence Olaf collected from Dalli's aides. 1.31: Kessler says Olaf informed the Maltese Attorney General of the new findings. 1.33: Gatt paints the picture: Gabrielson and Delfosse during investigation say they believe request for bribe came from Dalli; two witnesses after the investigation claimed Dalli tried to propose lifting snus ban. Gatt asks whether Olaf is informed that police decided not to charge Dalli despite Olaf's recommendation he was involved in bribery with Zammit. Kessler says he got to know of this through the media. 1.36: Kessler met former Police Commissioner Peter Paul Zammit at an Interpol conference months after he had declared Dalli investigation closed. Kessler says Peter Paul told him investigation was still ongoing and it was all a case of miscommunication. Kessler cross examination is over. 1.43: Eduardo Calo Romera, an Olaf investigator is now testifying. 1.45: Romera was lead investigator in the Dalli case and was involved in all key interviews. He identifies Zammit in courtroom. Zammit makes no reaction. 1.49: Romera gives details of the investigation. He confirms the first interview with Kimberly was not pre-advised. This was done to ensure first testimony was not contaminated. The interview started at 9.30am and ended at around 4pm. 1.51: Romera says Kimberly spoke of the February 10 meeting she should have attended with Dalli. 1.52: After the interview, Olaf decided to change the status of Kimberly to 'person concerned', which meant the contents of first interview could not be used unless reconfirmed by her in a second interview. Kimberly, more or less, confirmed content of first interview in a second interrogation in September 2012. 1.55: Romera says Delfosse in March 2012 had called Zammit to ask whether it was possible to arrange a meeting with Dalli. Zammit told her it was possible but at a cost. Zammit hung up and called Delfosse sometime later. 1.56: The second phone call was recorded by Delfosse. The court will now here the phone recording between Delfosse and Zammit in March 2012. 1.58: The pen drive with the recording was provided to Olaf by Delfosse. The pen drive was labelled Estoc. The phone conversation was 11 minutes long. Zammit: it took more than 10 minutes. 2.02: Delfosse: you can guarnetee a lifting of the ban? Zammit: regarding the price, at least after the first high level first meeting which we could do anywhere you like on the mountainas, on the ice... Even the moon... €10 million. 2.03: Zammit: tell us where you want to do it... It will be a one to one meeting where you say exactly... Get the feedback on how proposal will be announced... Once your boss and my boss are together they will be discussing the issue how to further this issue. Delfosse: i have a scientific case which i hope to win without having to pay. Zammit: for everything there is a price. We are doing a job. 2.07: Delfosse: I get a salary and i accept my job. 2.09: Delfosse: Did John say anything whether there was enough time to change anything. Delfosse: that was a month ago, is it still now? Zammit tells Delfosse this was not a good cause because smoking was bad. Delfosse says she will confer with her bosses. 2.10: Zammit: obviously don't mention the guy. If you mention the guy i don't answer you. I speak for myself. 2.11: Zammit asks Delfosse to verify whether her bosses will be interested and if they are not to inform him. End of phone call recording. Romera confirms the phone recording is the one Delfosse passed on. 2.13: Romera says Delfosse's reference to rumours was the Commission's finalisation of the tobacco proposal being tabled. If this moment lapsed it would have been impossible to change anything. 2.20: Romera says the phone call was referred to during Zammit's interview. Zammit was tense, arrogant, dismissive and excessively dramatising things, Romera says. Zammit referred to his boss as "God", he adds. 2.23: Romera says on first day of interview, Zammit left claiming health reasons. The interview continued the day after. Romera testimony over and cross examination starts. 2.25: Defence lawyer Gatt asks why Olaf took its time to come over for court case. Gatt asks whether anybody had threatened Olaf officials not to come to. Malta. Romera says he is not aware of any such threats. Magistrate asks defence to stick to relevent questions. Romera says he never met Kimberly at all while in Malta to interview Zammit. He is asked about the fresh allegations on Dalli by his former cabinet officials. 2.27: Romera says on July 10, 2014 he passed on new evidence to Maltese AG. AG representative asks what type of communication this was. 2.28: Romera says it was a request for further investigation. 2.34: Olaf official Svetelina Cherekova is now testifying. She was part of the investigative team in the Dalli case. 2.40: She reiterates much of what has already been said by Kessler and Romera. 2.43: Cherekova says Kimberly never objected to the content or statements in her first interview. She did not object either when questioned a second time in the presence of her lawyer. Cherkova testimony is over with no cross-examination being requested. 2.45: Olaf investigator Alberto Potenza is called to the witness stand. 2.51: Potenza was involved among others in searches of Dalli's offices and his assistant Frank Zammit. 2.52: Potenza says he was assigned to an additional investigation on Dalli concerning his visit to Bahamas. This investigation came after the snus case. Potenza says he interviewed two members of Dalli's cabinet: Joanna Darmanin and Paula Duarte. 2.53: The information from these interviews was forwarded to Maltese AG on July 10, 2014. 2.56: Potenza submits full transcript of Darmanin interview as evidence in court but full transcript for Duarte will be submitted at later stage. 2.58: Potenza says Darmanin was interviewed on July 22, 2013 and she submitted additional documents for inclusion later that month. She was interviewed again on July 26, 2013 because of certain inconsistencies. Potenza confirms the information was forwarded to Maltese authorities a year later because investigation was not concluded. He says it is still not concluded. 3.00: Court session suspended until prosecution and defence go over Darmanin transcript. 3.15: Potenza testimony is over. No cross examination requested. 3.24: Today's court session is over. Case continues on May 21 at noon. Last August, Mr Zammit’s defence team was given notice to prepare for such a session but at the time OLAF officials and other witnesses said they had not been informed of the event. Last June, Mr Kessler was expected to travel to Malta but the summons was sent to him only a few days before the hearing and he could not make it. Mr Zammit is pleading not guilty to charges of trading in influence after being accused of asking tobacco company Swedish Match for a bribe of €60 million in exchange for the lifting of a ban on snus, a form of smokeless tobacco that can only be sold in Sweden. Former European commissioner John Dalli was forced to step down in October 2012 over the case. Following an investigation by OLAF, Mr Kessler concluded there was circumstantial evidence to show Mr Dalli was aware that Mr Zammit, a friend and former canvasser of his, was using his name to solicit a bribe. Mr Dalli has vehemently denied the charge and has even instituted a court case before the European Court of Justice contesting his forced resignation. The case against Mr Zammit has been dragged out because of postponements and logistical bungles. In a previous session, the court heard via video conferencing Tomas Hammagren, former executive at British American Tobacco and then chairman of the European Smokeless Tobacco Council. His involvement in the case is linked to an informal meeting that Mr Hammagren had with Mr Dalli in August 2010 which was arranged by Mr Zammit. The meeting was not particularly eventful, the two men briefly exchanged views on the regulation of snus and the executive handed over some papers arguing the line peddled by the lobby. However, the off-the-books meeting was deemed by then European Commission president Manuel Barroso to be in breach of the EU commissioners’ code of conduct.